A foot printThe Department of Homeland Security (DHS) Science and Technology Directorate (S&T) worked with United States Border Patrol (USBP) and the Federal Law Enforcement Training Centers (FLETC) to research and develop training content and methods to enable USBP agents to leverage knowledge, skills, and abilities of the expert trackers in their workforces. This new training solution, called Signcutting and Tracking, officially transitioned on November 9, 2018, has been tested at the U.S. Border Patrol Academy and will be deployed to locations along the U.S. southern border in 2019 to allow the capability to be utilized by both new hire agents and those already on the front lines in national security. S&T’s new Signcutting and Tracking training package is a three-part solution combining 2D and 3D training videos, a 90-minute computer-based training course, and innovative commercial off the shelf (COTS) augmented reality technologies identified through technology scouting. The three components were combined to deliver a solution to USBP that maximizes the efficiency and effectiveness of border patrol agents in executing tracking (also called signcutting) along our nation’s borders, explained DHS S&T Program Manager Darren Wilson. The training content was also transitioned to FLETC to be leveraged in their backcountry tactics and tracking course for those federal, state, and local organizations developing skills for search and rescue, crime scene investigation, and fugitive capture operations. The 2D and 3D video component breaks down the visual signs of human activity across various terrains and explains how to identify those signs. “Signcutting” identifies telltale indicators of movement through the southern border’s desert or northern border’s wooded areas. To develop the training, USBP and FLETC’s expert trackers worked with S&T’s research and development team. S&T conducted research both in classrooms at the US Border Patrol Academy and in the field at various locations along the U.S. southern border, through detailed interviews, analyzing current training content and tools, and conducting ride-alongs with expert trackers to break down and fully understand the core elements of the tracking task by identify those tactics and techniques that make expert tracker most effective. “The new training shows navigations and tracking – signcutting – from different environments,” said Scott Glisson, Senior Instructor for Tracking, Land Navigation and Field Skills, FLETC. “The interpretation of different environments will cause you to look for different things.” Having the various venues or terrain environments portrayed in the training videos allows USBP agents and law enforcement officers to be more effective when arriving at different locations because they’ll already have been introduced to that environment. The ARES displaying imagery dataTo demonstrate the effectiveness of the new training content, a Post Transition Performance (PTP) Assessment was conducted at the U.S. Border Patrol Academy. Two groups of new Border Patrol Agents (BPAs) participated to compare the impact of existing training methods to the new Signcutting and Tracking Training package. One group was given the legacy classroom instruction and the other used S&T’s new video and computer based training. Both groups then went out into the field to demonstrate their skills as part of their practical assessment in “tracking boxes” that instructors use to assess each individual’s tracking skills. Those agents who received their signcutting and tracking training with S&T’s new training package performed 63 percent better than those agents who received the existing training. In 2019, S&T is collaborating with eFLETC, FLETC’s online campus, to make the training accessible across the DHS Enterprise as well as to state, local and tribal law enforcement officers. 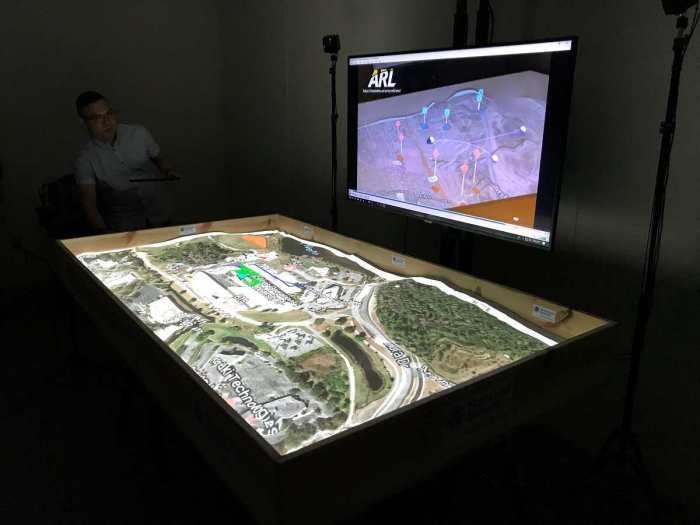 Also in 2019, S&T will transition the third piece of the training package, which includes the Augmented REality Sandtable (ARES). DHS S&T transitioned the first ARES to the U.S. Border Patrol Academy in 2018 and will transition this capability to forward operating locations along the southern border at various sector headquarters in 2019. Research and development for ARES was originally funded by the U.S. Army and is an example of technology scouted by DHS S&T and repurposed to meet a DHS need. ARES uses a commercial 3D motion camera to track the topography of the sand and then overlays a map or other data being viewed using a standard projector. The Sandtable will be very useful for training, enhanced visualization and situation awareness, as well as mission pre brief and after action review, Wilson said. A capability for mixed reality headsets as well as a floor projected version for briefing larger groups, are also variations of the capability that can be networked together for coordination of exercises or operations in different locations. This innovative technology scouted by DHS S&T combined with the 3D video and computer based training course developed by S&T provide a solution for USBP and FLETC to maximize the knowledge, skills and abilities of agents and officers in identifying and tracking movement of personnel to enforce immigration laws, counter drug and human trafficking, pursue fugitives, and conduct search and rescue operations.